Many argue bitcoin is in a bubble. Did we stop using the internet after the dot com bubble burst? Overstock's subsidiary Medici Ventures is betting the same will happen again, but this time, blockchain technology will blow the world away even more than the online revolution did. Overstock (OSTK - Get Report) is fully engrossed in bitcoin mania. On Dec. 8, Morgan Stanley (MS - Get Report) disclosed in an SEC filing that it holds an 11.4% stake in the company, or about 2.87 million shares, as of the end of November. The investment management section of Morgan Stanley has about $447 billion under its purview. Overstock shares have rocketed higher more than 200% since the start of the year. They have been supported not only by news of the Morgan Stanley stake, but also the rise of bitcoin as a legitimate currency. Overstock began accepting bitcoin as payment in January 2014. "Shortly thereafter, we became enamored with bitcoin's underlying technology," Overstock board member Jonathan Johnson told TheStreet in an interview. A large part of Johnson's day-to-day at Medici revolves around furthering Overstock's digital currencies operations. The list of to-dos under that umbrella has grown rapidly as Overstock, once a pioneer of internet retailing in the 1990s, becomes the newest explorer of the wide-ranging possibilities at the intersection of blockchain technology, digital currency and eCommerce. While Forte estimates digital currency transactions represent only 0.25% of Overstock's total sales -- which reached $424 million in the third quarter -- they're a growing piece of the puzzle as Overstock moves to capitalize on "enthusiastic" bitcoin followers, Johnson says. It's still a while down the road before bitcoin becomes a regularly used payment option for eCommerce transactions. That's not because bitcoin is sub-par payment. It's because it's viewed as an investment instead of a currency. Johnson compares bitcoin to Apple's (AAPL - Get Report) stock. He gets his paycheck in dollars and only transfers those dollars into Apple's stock to hold as an investment. Right now, Johnson can't buy a McDonald's (MCD - Get Report) cheeseburger with Apple's stock. The same goes for bitcoin -- for the moment. 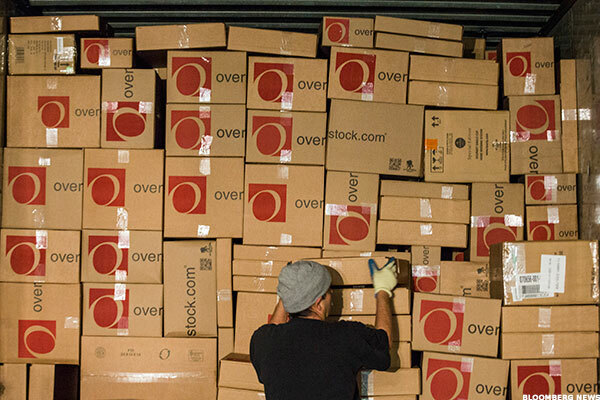 Overstock thinks it's on the cutting-edge of changing that perception. After initially transferring all crypto sales to dollars, the company now holds up to 50% of its crypto sales in bitcoin and other digital currencies. "We think that blockchain is going to be more revolutionary than the internet," Johnson boasts. It democratizes capital, gets rid of the middleman and re-humanizes transacting, Johnson says. But let's be real, bitcoin is ridiculously risky. "It's essentially the same risk that a multinational corporation would have in exchange rates," Forte explains. Bitcoin, for example, fluctuates far more than the British pound. Forte says the best means of reconciling the two is comparing trading in bitcoin to trading in a fiat currency from a Latin American country with hyperinflation. Johnson steadfastly disagrees with the assessment. In a country with hyperinflation, the currency loses buying power as it increases in face value. Johnson submits the opposite as true. "As bitcoin increases in value, it's a great store of value," Johnson says. That value has come under intense scrutiny with each price milestone that bitcoin achieves. Many finance luminaries such as JPMorgan (JPM - Get Report) CEO Jamie Dimon have cast bitcoin aside as a bubble -- Johnson thinks the real answer is somewhere in between. "They're probably right in the short term, but wrong in the long term," Johnson said. To him, bitcoin is a bubble only in that it can be compared to the internet stock craze of the late 1990s. That bubble obviously burst in epic fashion, but the value of the internet as an institution is incomparably larger than any internet stock was pre-burst. Should bitcoin pop, the intrinsic value of its blockchain technology will likely grow far beyond what it's considered to be worth today. "The world got more digital with the internet," Johnson said. "It will only get more digital with blockchain." For now, Overstock and Medici are content abstaining from comment on why other eCommerce players have yet to adopt crypto. Johnson says he's not in the business of commenting on the competition, but it's "shocking" other e-tailers haven't made it easier for their customers to buy things online. As for Overstock, its bitcoin foray has largely worked. The portion of Overstock's sales derived from crypto payments is still small, but it has grown to represent more than $100,000 of the company's weekly transactions compared to $30,000 per week at the start of the year. "We think cryptocurrencies have a bright future," Johnson opines. "And we think blockchain has a white hot future." But is Bitcoin mining destroying your electric bill?